A spring day a few weeks back I had the chance to visit Milburnie Dam on the Neuse River in Wake County. The dam used to produce a small amount of electricity but now is the subject of controversy over whether it should remain where it stands or be removed. Among other things, those who want it removed argue that the dam is a safety hazard and that it impedes the path of migrating fish. Advocates for keeping the dam have set up a Facebook page to call for its preservation. On it they describe their concerns for losing the pool and wetlands that lie behind the dam and its general aesthetics that they have grown to appreciate. Of course, money has a role in the story. According to the last dam removal prospectus released by Restoration Systems, the company sponsoring the dam’s removal, the company hopes to gain approximately 32,590 feet of credit for restoring the stream length impounded by the dam. If the company is successful and able to achieve the benchmarks needed to satisfy regulators, those credits would be worth millions. With that kind of money at stake, the company has sunk a lot of time, effort, and financial resources into their dam removal campaign. This campaign includes a website and promotional videos. While the project has supporters, it has yet to win approval from the agencies responsible for permitting the project. 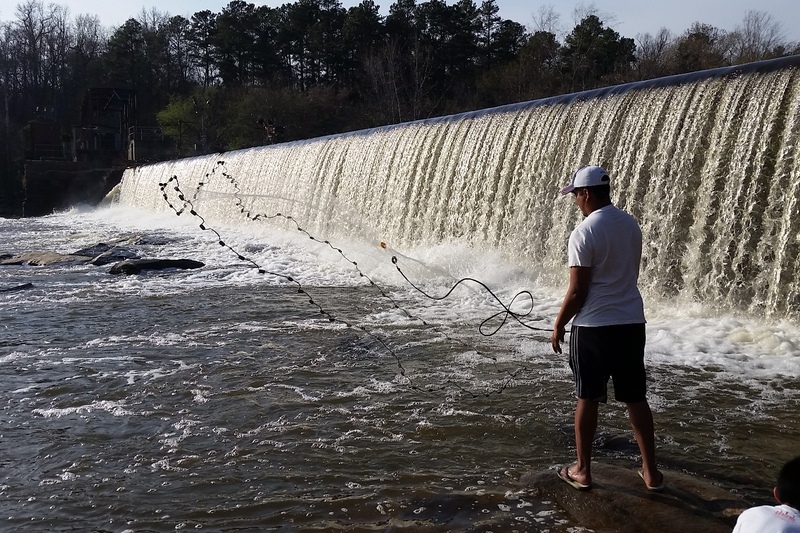 Milburnie Dam standing in the way of fish migrating upstream and making for easy conditions to catch shad. Easiest shad these two will ever catch. This brings us back to our recent visit. Hanging out below the dam, an angler threw out a net to catch bait fish. In several throws, he was able to bring back over a dozen shad stuck at the dam. He through those back as he was looking for smaller fish for bait. 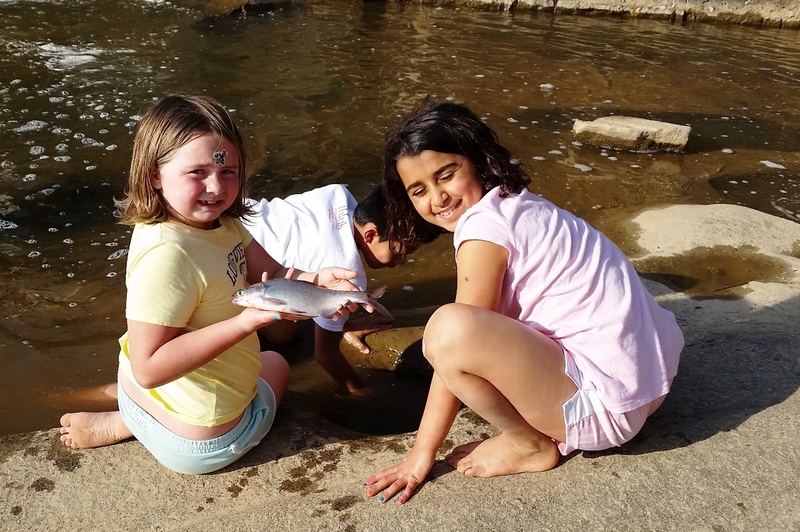 Still, for those fish stuck at the dam, it would be nice to see Milburnie removed in a way that benefits both those advocating for its preservation and those seeking to remove it. That solution would be most beneficial to those species suffering from its existence.